Of all the barbecue restaurants in America, Short Sugar’s Pit Bar-B-Q must have the greatest name. Johnny, Clyde, and Eldridge Overby had planned to call their new business the Overby Brothers Drive-In. But two days before it was to open in June 1949, Eldridge was killed in an auto accident. Instead of using the original name, Johnny and Clyde decided to honor their brother, who had been known as “Short Sugar,” by naming the place after him alone. Now, the stories vary as to why Eldridge had that particular nickname. It seems well established that he was short, which takes care of the first half. But as for “Sugar,” time has muddled people’s recollections of whether it was because Eldridge was exceptionally friendly and had an attractive laugh or whether it was because the ladies considered him kind of cute. In any case, even though Eldridge didn’t live to see the restaurant open, his nickname has certainly been immortalized, since it’s the one thing no one ever forgets about the place. Today, Short Sugar’s sits at the same location and still looks like a 1950s-style teenage hangout, which is exactly what it became on the first day it was open. It even has drive-in parking spaces where customers still can get curb service just by tooting their horns. 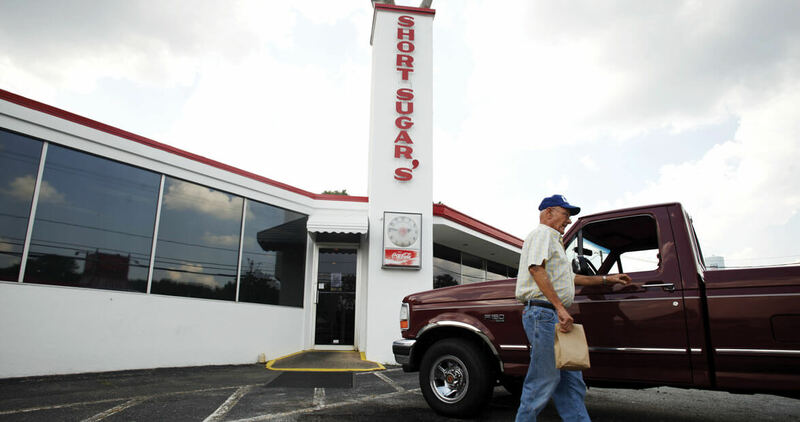 And although Short Sugar’s may not be a hot gathering spot for the current students of Reidsville High School, the folks who grew up in town during the 1950s, ’60s, and ’70s still flock to the place, as do seekers from all over central North Carolina who’ve heard about the barbecue and had their interest piqued by the name.